Busters Dog Walking Services was established in September 2008 in Brentwood, Essex by Linda Ward after volunteering for dog rescue for two years. Over the past decade, we have looked after around 500 dogs, many of the puppies when they come to us. All have had the same degree of love and attention. There is not much we don't know about dogs! Busters Dog Walking Services has a small back up team of family members and other local dog walking businesses who get to know all of our dogs. You never need to worry that your dog won't be walked because there is always someone your dog knows to cover emergency leave or sick days. Dogs are transported in fully equipped, air-conditioned vehicles with custom built dividers and/or crates for your dog's safety and comfort. Our vehicles are licensed by Defra, and tracked 24/7 using GPS technology. While Linda does the dog walking on a day to day basis, all of the dog walkers who help Busters from time to time are thoroughly vetted and checked to ensure they have that vital characteristic - a genuine love of animals, plus are reliable and trustworthy. They all have a criminal background check through their own businesses, training in basic dog behaviour and are knowledgeable about your dog's breed and individual needs. Linda's knowledge is endless and I was amazed by the control she has of the pets she is looking after. She always treats them with respect and kindness. Linda is so professional and I have seen how she has gone the extra mile to make sure all her clients and pets are happy and satisfied. Linda has been an inspiration as a professional and as a person. Thank you! Linda started the business in 2008 - named after her beloved dog Buster (1993-2007). She owned a Greyhound, Beauty (2001–2016), and has a Jack Russell x Patterdale Terrier called Fred. Fred needed a lot of extra support after coming into rescue before he was even a year old, and so 'Busters Dogs' was born to keep this support going for him. Linda also owns Tinker, another Jack Russell x Patterdale Terrier. Linda covers all the dog training appointments, all of the puppy play and trains, and trains any staff members we may have. She also trains external dog walkers through her dog walker training workshops. Linda ensures she stays up-to- date with the latest developments in the dog world, attending seminars and conferences all over the UK regularly, keeping her dog training and behaviour knowledge current. She competes in Obedience with her terriers, as well as gracing the (Cross)Breed Show ring whenever time allows, and enjoys learning new ways of training dogs. 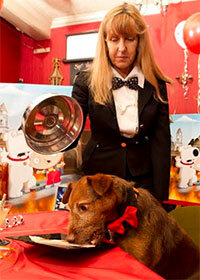 Linda supplies trained acting dogs for TV, film, You Tube etc. Her own dogs are experienced and highly trained, and Linda can source and train a wide variety of breeds as required for both stills photography, and live action. Experienced trainers and professional handlers are provided at competitive rates. Linda has appeared with her dogs on television, and in magazines and books as well as appearing in the local papers many times. Thank you very much for yesterday's training. I found it very useful, packed with great tips and advice and enjoyable too. No doubt I'll be in need of your services again once I get up and running. You're certainly a font of knowledge when it comes to all things dogs! Our dog walkers all have to complete a rigorous training programme, which lasts around 2-3 months before they are considered fully trained. Dog walking is not rocket science, but there is a skill to walking groups of dogs not your own, off the lead, while keeping full control, not causing other park users any problems, and avoiding 'hazards' such as horse riders, runners, cyclists, children and picnickers. Each new dog walker gains experience under the watchful eye of a fully trained dog walker, before being assessed as ready to walk dogs on their own. The team are also trained in dog training and behaviour, dog law, animal welfare, and canine communication. We also offer training for dog walkers who are starting up or growing their own business. We don't currently employ any regular staff members, but watch this space!